A busy early season on the road for Eleanor Dickinson included finishing top 10 at the Junior Energiewacht Tour, winning a stage of Omloop van Borsele and finishing 13th at The Women's Tour of Yorkshire before claiming the British junior national title in May. The past two months have seen the 18 year old turn her attention back to the track for the Junior European and World Championships. Dickinson's European Championships started strongly on Tuesday with bronze in the team pursuit in a new personal best time. With little more than time to change numbers she was back on the track in the scratch race. Having claimed silver in 2015 her eyes were on gold but she would narrowly miss a medal. Finishing fourth and further motivating her for the individual pursuit on Wednesday. The previous days disappointment in the scratch race didn't stop Dickinson shaving a massive three seconds off her PB in individual pursuit qualifying with a time of 2:26.914. With her catch and passing of her opponent catching the eye of dual Olympic and seven time elite World Champion Laura Trott. Having qualified for the bronze ride Dickinson posted her second fastest time ever but fell just short or bronze, picking up another frustrating fourth. Despite the disappointment, the personal best in the IP, an event that had let her down in the past leaves her full of confidence ahead of the World Championships next week. Won the British junior road race title in May how did the race play out for you? The junior British road champs was a great race on a tough course! It's always difficult when riding in with the seniors because you then have to really track who's who! A group formed off the front which included three of my team mates, no juniors so I was cool to let that stick. I knew I had to position myself well at the bottom of the climb and not look back untill I crossed the line! And that's what I did, started the bottom of the climb along side Sophie Wright and Jess Roberts, I was in the middle of the three so it wasn't ideal not having the option of the gutter but yeah I put my head down and hit it as hard as I could from the bottom! Been the youth national champion before what does it mean adding the junior title? To win the junior title was a massive achievement for me, there is some really great competition in the junior category so I was over the moon to take the win. Raced the U19 European Track Championships last year do you think that experience helped you this year? Yeah definitely! Every race is different and every track is different but it helped me in that I know what to expect! Claimed bronze in the team pursuit on the opening day a good result for you and the team to start with? We were chuffed with the TP result! It's our first big international event together as a team and we worked perfectly, which showed well in our result! A PB for us all so we can't complain! Had a quick turn around on day one and were back on the track for the scratch race. After claiming silver last year you must have had high hopes for a strong ride? Finished fourth just outside of the medals how did the race go? The race was boring! Nothing happened, rolled round on the blue then a big sprint! It was so tense around the track, very sketchy. I got hooked onto the Italians wheel because I knew she would be the strongest, but we came from too far back and it was quickly over! There's my mistake! Set a new PB of 2:26.914 in IP qualifying taking three seconds off your previous best of 2:29.920 happy with the time and how you executed the race? I was dead happy with a 2.26! Last year I would have laughed if you'd have said I would get under 2.30 in an IP!! I knew that IP was an event that let me down in the omnium so it's something I have worked really hard towards and to see that time on the board and get a second ride meant a lot especially after a rubbish scratch! 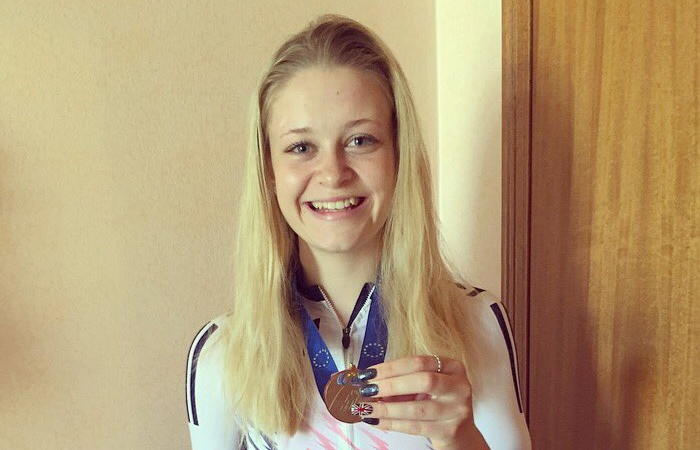 Received a tweet from Laura Trott ahead of the IP final about your catch of your opponent in qualifying what did that mean to you? It defiantly put a massive smile back on my face!! It was really lovely to read especially before riding a final! It was amazing to hear she thought my catch was perfect too! Finishing fourth in the IP must have been disappointing being so close to another medal but at the same time you finished with the two fastest time you have ever ridden? Yeah, it's a funny one. Sometimes your best just isn't enough! I gave it everything but it wasn't enough. I'm gutted with two fourths to say the least. It's a hard place to finish twice! With bronze in the team pursuit and 4th in the scratch and IP can you take confidence from those results in to Worlds? We work very well as a team and we all have confidence in each other so for sure we will go out to worlds and try our best in the TP and try and go quicker again. I'm really excited to get stuck into my first omnium at the worlds! I can't wait to go out there and see what I can do. I know the consistency is there I just hope it's not fourth!!! Busy first two days of European Championships but you have a few days break now ahead of Worlds. With the two events in quick succession how important is having a few extra days between them to recover? My first couple of days here have been pretty full on and the legs were feeling it, yesterday I had a nice relaxing day with a ride to Lake Garda with some of the girls. Today I will be back on the track for a training session, but yeah for me now it is all about resting up looking after myself to get the best recovery so I can head to the worlds feeling recovered and confident! Racing the omnium at the World Championships what are your goals for Worlds? It will be my fist omnium at a major event! I've set some PB's for the timed events coming into this trip so I'm really looking to improve on them and get stuck in to the bunch races! I need to be consistently up there. Raced Road World Championships last year but this will be your first track event with a full international field what do you think the biggest challenge will be? I think it will be a big challenge but I'm looking forward to it. I think the most challenging will be coping with the atmosphere associated with such a big event!